Poor Man's Orchid they called it in the early 1800s, named for the open-faced flowers of white, pink, red and violet, each with delicate markings of varying colors arrayed along the pale green stems. A branching habit allows for a multitude of blooms that eventually fade as summer heat takes over. Also, fun to grow as a windowsill plant for a needed flowery reminder that spring will come! Starting Indoors: Recommended in hotter summer areas. Start indoors in vermiculite 8 weeks before last spring frost, watering from below as they are susceptible to damping off. Starting Outdoors: Direct sow in 2-3 weeks before the last spring frost date. 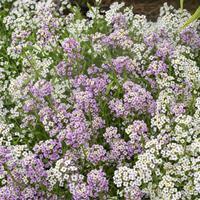 Schizanthus is an amazing annual for attracting pollinators and is an old-fashioned cottage or cutting garden flower. It does best in cooler locations with full sun, afternoon shade if growing in hotter locations. Also does well in containers, provided that the growing medium and container are well-drained. Pinch back when seedlings reach about 4" tall to encourage a more bushy habit. Watering Details: Keep moist but not soggy. Fertilizer: Mix in a couple of inches of compost into the soil if planting in the ground. If compost is not incorporated into the soil, top dress with a slow-release organic all-purpose fertilizer or with a water soluble fertilizer. Flowering: A mix of white, appleblossom pink, red and violet hues on orchid-like flowers. Seeds: Flowers turn into two-valved capsules containing many small brown seeds. S. wisetonensis is a hybrid between S. pinnatus and S. grahami.